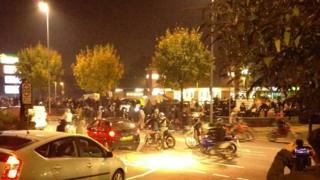 Image caption More than 100 bikers caused chaos on the streets during the Halloween "ride-out"
The organiser of a Halloween "ride-out" which brought Leeds city centre to a standstill was responsible for encouraging "mayhem", a court heard. David Armitage did not take part, but filmed a live video on Facebook telling viewers "carnage, that's what we do". The incident saw a large number of motorcyclists tear through streets and pedestrian areas in the city. Armitage, of Headingley, was one of 13 defendants who appeared at Leeds Crown Court on Monday. All had admitted causing a public nuisance at a previous court hearing and were given bail until sentencing on Tuesday. Witnesses likened the scenes on 31 October to the Mel Gibson film Mad Max. Andrew Horton, prosecuting, told the court: "The motorcyclists were travelling en masse with over 100 riders, some not wearing helmets but wearing Halloween-type face masks of varying descriptions." He said footage showed the bikers speeding, weaving between traffic and performing wheelies. "The riders showed little or no regard for the safety of others," he told the court. Mr Horton added that Armitage "directed and encouraged riders... and was shown cheering and embracing riders". Police received about 160 calls from the public and were forced to close a section of Kirkstall Road. The court also heard many of the riders had expressed regret when interviewed by police. Mr Horton said Nicholas Flaherty told police "he would never normally ride in that manner but it was such a buzz, it was like he was in a film". Another rider, Dean Fawcett, said in interview that he "thought it was a good idea but quickly realised it was turning into mayhem and that was not his intention". The court also heard the event raised about £400, which Armitage initially claimed would go to Children in Need, but later said any money raised would go to the family of a local murder victim. Deborah Smithies, representing Armitage, said he became confused after his arrest about what to do with the funds, which he still holds, "and stands ready to direct them where appropriate". All 13 defendants pleaded guilty at an earlier hearing to "causing a public nuisance by participating in a large-scale procession of motorbikes and similar vehicles that rode around Leeds in a manner that interfered with the comfort, enjoyment and safety of the public".